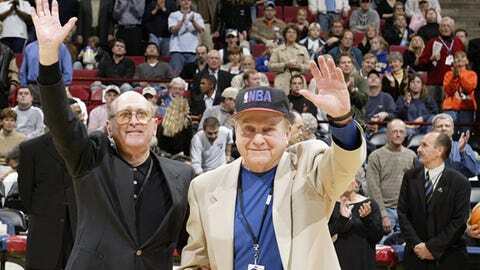 Former Minnesota Timberwolves owner Marv Wolfenson (right) died Saturday, at the age of 87. MINNEAPOLIS — One of the men who helped bring NBA basketball back to the Twin Cities has passed away. Former Timberwolves owner Marv Wolfenson died Saturday morning in La Jolla, Calif. He was 87 years old. The NBA granted Wolfenson and fellow health club and apartment mogul Harvey Ratner an expansion franchise in 1987. The Timberwolves began play at the Metrodome in 1989 while Wolfenson and Ratner oversaw construction of the Target Center. "Marv will long be remembered by our organization as not only an original owner of the franchise, but more importantly a mentor, friend, and incredible businessman who helped us all establish the Wolves in this market," a team statement said. "Our thoughts and prayers are with his family at this time." From 1947 to 1960, the Minneapolis Lakers called Minnesota home. The franchise then relocated to Los Angeles. The pair of Minneapolis-bred entrepreneurs — "Harv and Marv," as they came to be known — sold the Timberwolves to current owner Glen Taylor in 1994. Ratner passed away in 2006 at the age of 79.